7. Magic Kingdom – Magic Kingdom is the best place to get the bulk of the classic characters checked off your list. If the Frozen sisters are important to you, definitely get a Fast Pass for them. The lines for the other princesses don’t tend to be quite as long, so you may just want to wait them out. Don’t forget the Fairytale Garden…it often gets overlooked on the edge of Fantasyland, but it’s a great meeting spot (currently Merida is there). As for Mickey and pals, my personal recommendation is to wait and greet them in another park that has fewer other characters. For Buzz and Woody & Jessie, perhaps time these greetings when taller members want to ride Space Mountain and Splash Mountain respectively. Other heavy-hitters that you’ll want to hit at MK are Tinker Bell and Peter Pan. Now that the Incredibles have been taken out of Hollywood Studios, your best chance to see them is at the dance party in Tomorrowland. Characters like Pooh, Rafiki, and Aladdin are usually available in other parks. Don’t forget to always check the app for other character appearances that may be less predictable like Stitch, Mad Hatter, or Eeyore. 6. 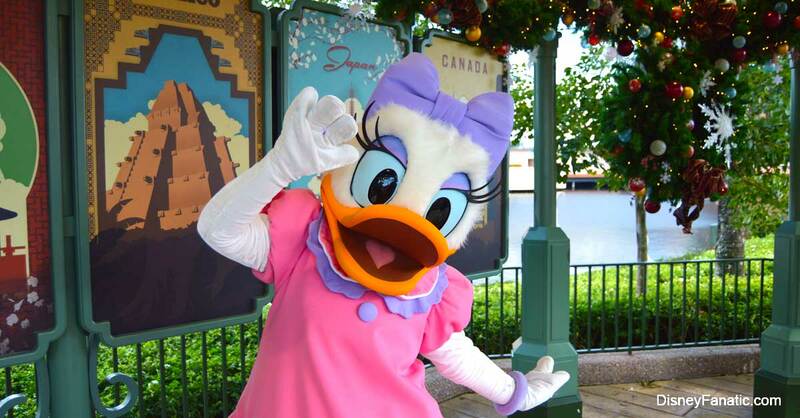 Epcot – This is my favorite park for character greetings! Epcot is a great place to round out your princess list with ladies like Mulan, Jasmine, Belle, Aurora, and Snow White. Anna and Elsa are supposed to be added to the Norway pavilion in the next few months as well. Epcot is a great place to meet Mickey and pals, and if you’re a Disney Visa cardholder you can even enjoy a special greeting in Innoventions. In the UK pavilion you can usually find Alice and Tigger & Pooh with very little wait times. And finally, brand new to Epcot’s Future World – Baymax! 5. Hollywood Studios – Star Wars fans, this is your place for greetings! The addition of the Star Wars Launch Bay has offered dedicated greeting spots for Chewbacca and Darth Vader, and again Disney Visa cardholders have a special Imperial meet ‘n’ greet. You’ll also find Jawas roaming around there. If your children are into Disney Junior, you’ll want to dedicate some time for Jake, Doc, and Sophia. Other HS exclusives are Phineas and Ferb, Mater and Lightning, and Mike and Sulley. I tend to think that the lines for Buzz and Woody are better at Magic Kingdom, though here you can get them both together which is a bonus. Green Army Men roam around freely by Toy Story Mania, so catch a pic with them if they pass by. Here’s one more HS character tip for you: dedicated Disney fans whisper about “Character Palooza” where surprise characters come out for just 20 minutes or so near the entrance or in Animation Plaza. I’ve never been lucky enough to catch them, but if you’re vigilant maybe you can take advantage of this Disney legend. 4. Animal Kingdom – Animal Kingdom is my favorite spot for Mickey and Minnie…you’ll find them together dressed in their safari gear! Though usually not entirely necessary, you can Fast Pass that greeting if you find yourself in the park at a peak season. Some others you should meet at Animal Kingdom include Rafiki, Pocahontas, Tarzan, Flik, and Dug and Russell. 3. Halloween Party – The Villians come out at Halloween! Exclusive meetings at the Not So Scary Halloween Party include folks like Cruella DeVil, Jafar, and Lotso. You’ll also find the Seven Dwarfs, Jane (with Tarzan), and Jack and Sally. 2. Christmas – Mickey’s Christmas Party in Magic Kingdom is a great way to meet the Seven Dwarves, as well as see the princesses with their princes. Jack Sparrow makes appearances, as well as the big man – Santa himself. My favorite Christmas tradition is the dance parties though. Specifically, this year in Hollywood Studios my kids got to dance with Bolt, Genie, Stitch, and more. Not an actual greeting, but happy candid photos are awesome…especially when it means no wait, no extra ticket, and lots of fun! Have fun making memories with all your favorites!